A carbonyl carbon bonded to two carbon atoms distinguishes ketones from carboxylic acids, aldehydes, esters, amides, and other oxygen-containing compounds. The double-bond of the carbonyl group distinguishes ketones from alcohols and ethers. The simplest ketone is acetone (also called propanone). The carbon atom adjacent to a carbonyl group is called the α-carbon. Hydrogens attached to this carbon are called α-hydrogens. In the presence of an acid catalyst the ketone is subjected to so-called keto-enol tautomerism. The reaction with a strong base gives the corresponding enolate. A diketone is a compound containing two ketone groups. Structure of acetone, the simplest ketone. In general, ketones are named using IUPAC nomenclature by changing the suffix -e of the parent alkane to -one. For common ketones, some traditional names such as acetone and benzophenone predominate, and these are considered retained IUPAC names, although some introductory chemistry texts use names such as propanone. Oxo is the formal IUPAC nomenclature for a ketone functional group. However, other prefixes are also used by various books and journals. For some common chemicals (mainly in biochemistry), keto or oxy is the term used to describe the ketone (also known as alkanone) functional group. Oxo also refers to a single oxygen atom coordinated to a transition metal (a metal oxo). A carbonyl group is polar. This makes ketones polar compounds. The carbonyl groups interact with water by hydrogen bonding, and ketones are soluble in water. It is a hydrogen-bond acceptor, but not a hydrogen-bond donator, and cannot hydrogen-bond to itself. This makes ketones more volatile than alcohols and carboxylic acids of similar molecular weight. The α-hydrogen of a ketone is far more acidic (pKa ≈ 20) than the hydrogen of a regular alkane (pKa ≈ 50). This is due to resonance stabilization of the enolate ion that is formed through dissociation. The relative acidity of the α-hydrogen is important in the enolization reactions of ketones and other carbonyl compounds. Two atoms of hydrogen are removed, leaving a single oxygen atom double-bonded to a carbon atom. Ketones are also prepared by Gem halide hydrolysis. Aromatic ketones can be prepared in the Friedel-Crafts reaction and the Fries rearrangement. Nucleophilic addition. The reaction of a ketone with a nucleophile gives a tetrahedral carbonyl addition compound. the reaction with an alcohol, an acid or base gives a hemiketal + water and further reaction with an alcohol gives the ketal + water. This is a carbonyl-protecting reaction. Electrophilic addition, reaction with an electrophile gives a resonance stabilized cation. 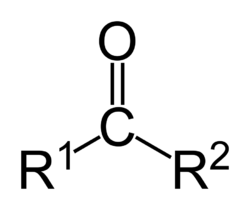 a reaction at an α-carbon is the reaction of a ketone with heavy water to give a deuterated ketone-d.
Acetone, acetoacetate and beta-hydroxybutyrate are ketones (or ketone bodies) generated from carbohydrates, fatty acids and amino acids in humans and most vertebrates. Ketones are elevated in blood after fasting including a night of sleep, and in both blood and urine in starvation, hypoglycemia due to causes other than hyperinsulinism, various inborn errors of metabolism, and ketoacidosis (usually due to diabetes mellitus). Although ketoacidosis is characteristic of decompensated or untreated type 1 diabetes, ketosis or even ketoacidosis can occur in type 2 diabetes in some circumstances as well. Acetoacetate and beta-hydroxybutyrate are an important fuel for many tissues, especially during fasting and starvation. The brain, in particular, relies heavily on ketone bodies as a substrate for lipid synthesis and for energy during times of reduced food intake. At the NIH, Richard Veech refers to ketones as "magic" in their ability to increase metobolic efficiency, while decreasing production of free radicals, the damaging byproducts of normal metabolism. His work has shown that ketone bodies may treat neurological diseases such as Alzheimer's and Parkinson's disease, and the heart and brain operate 25 percent more efficiently using ketones as a source of energy. Ketones are often used in perfumes and paints to stabilize the other ingredients so that they don't degrade as quickly over time. Other uses are as solvents and intermediates in chemical industry. Examples of ketones are Acetophenone, Butanone (methyl ethyl ketone) and Propanone (acetone). ↑ Table 27(a) Carbonyl compounds and derived substituent groups. Parent structures. IUPAC Commission on Nomenclature of Organic Chemistry. Retrieved June 29, 2007. ↑ 2.0 2.1 Yoshishiro Kashiwaya, et al (1994), “Control of Glucose Utilization in Working Perfused Rat Heart,” Journal of Biological Chemistry 269 (41): 25502-25514. This page was last modified on 16 April 2018, at 16:12.